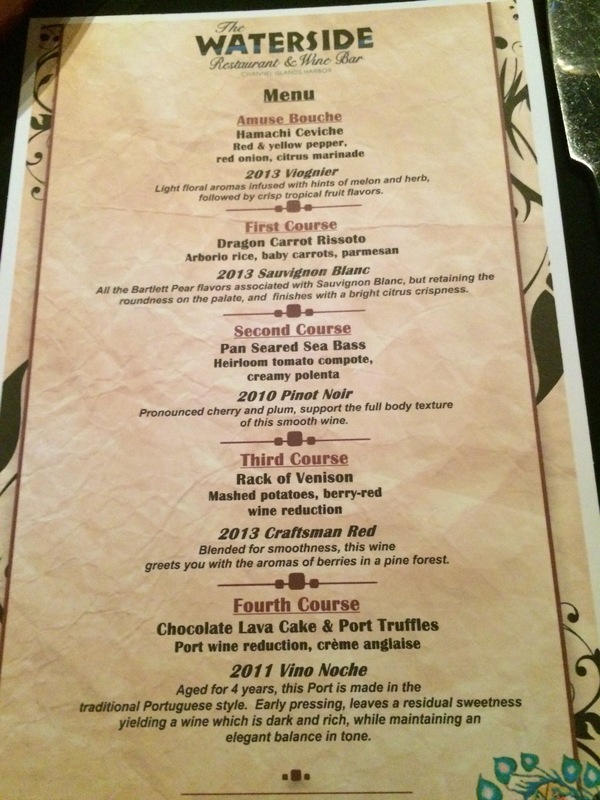 On Friday, eleven of us made the short trek from the Conejo and Simi Valleys to the Oxnard/Port Hueneme area for a wine pairing dinner at the Waterside Restaurant (LINK), featuring Casa Barranca Wines (LINK). The dinner was set up in the back of the restaurant and included a table for 12 or so in a back room and a table for 16 in the front room. I will speak to the food, the wine, and the execution of the concept. I want to begin by giving kudos to the owners of the Waterside Restaurant, who have created a very nice wine bar on a scenic marina in Oxnard. We had lunch there a while back and everything was good – the food, the wine, and the service. They hold a number of events during the week, and are working hard to bring a good wine experience to an area that has been generally lacking in good cuisine and good wine venues. As you can see, the menu was both ambitious and inventive. I should also note that some of the dishes were prepared differently for a member of our party who had allergies.The service was efficient and friendly. That said, there were some problems with the wine pairing event. The food was both inventive and beautifully presented, the chef used the paired wines in most of the courses. However, almost everything was served at a luke warm temperature at best. Part of this was due to the desire to have the chef explain each course after it was served AND having the winemaker describe the wine each time.This had to be done twice, as they could not be heard at both tables. They did finally alternate, with each speaking to a table then switching. I did taste a couple of courses as soon as they hit the table, and they were not hot. Something to think about for future events. The Casa Barranca Wines are organically grown at a historic winery in Ojai, CA. The winery shares space with a spa retreat facility. Grapes are sources from Santa Ynez for the most part. Winemaker Samuel Tulberg, represented the winery at the dinner. He was very knowledgeable about the wines and their process, as you would expect. The wines served were their 2013 Viognier, 2013 Sauvignon Blanc, 2010 Pinot Noir, 2013 Craftsman Red, and a 2011 Vino Noche Port. The Sauvignon Blanc and the Craftsman Red (56% Cabernet Sauvignon, 22% Cabernet Franc, 22% Merlot – and just 12.5% alcohol) were quite good. The Pinot Noir was very average, and the Viognier and the Vino Noche were just not very good. The wines that I liked (and this was the general consensus at the table) were complex and somewhat elegant, with nice hints of fruit and terroir in there. The Viognier was anything but elegant, had a chemical nose, and simply was not a pleasing wine to drink. The Vino Noche Port was very harsh on the palate and hot with alcohol. 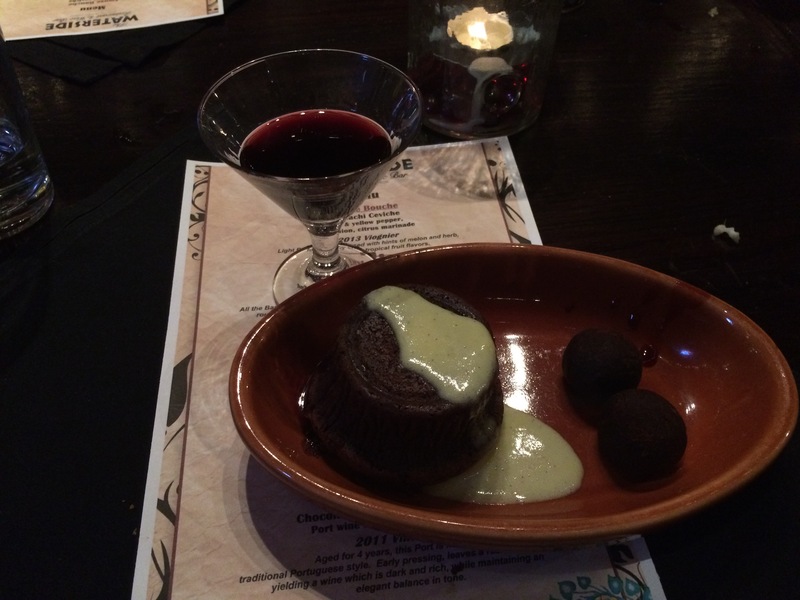 It was better with the dessert – chocolate lava cake, but still . . . I am sure that a visit to the Casa Barranca Winery is a fun outing, but I would not be going for the wines. Perhaps, over time, the wine making process will mature and even out. 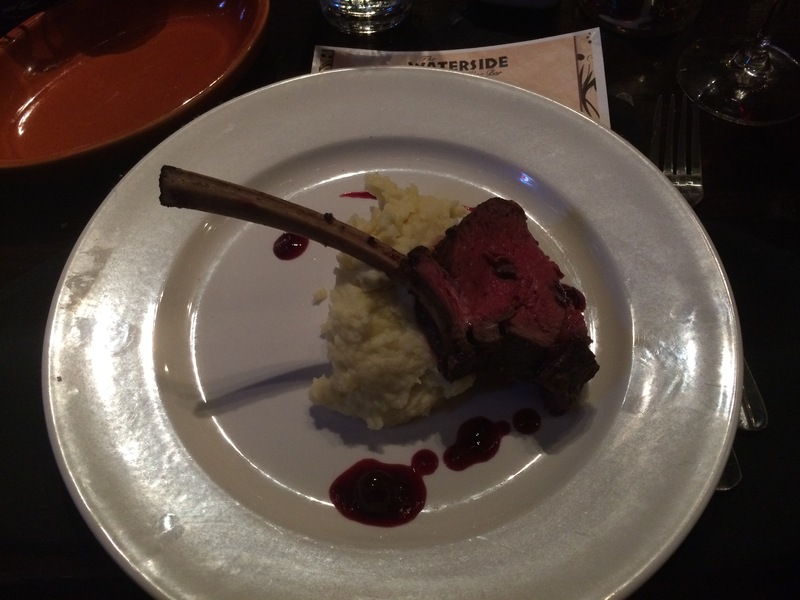 As for the Waterside Restaurant, I encourage them to keep on trying and working on their presentation timing for food at events such as this.